Figured it was about time I got around to posting this one. This is a leftover from about 4 months ago when I was planning on doing another “blended cocktails week.” However I instead just made this for 4 days straight, because it was just that good! (Glad I wrote down my tasting notes). 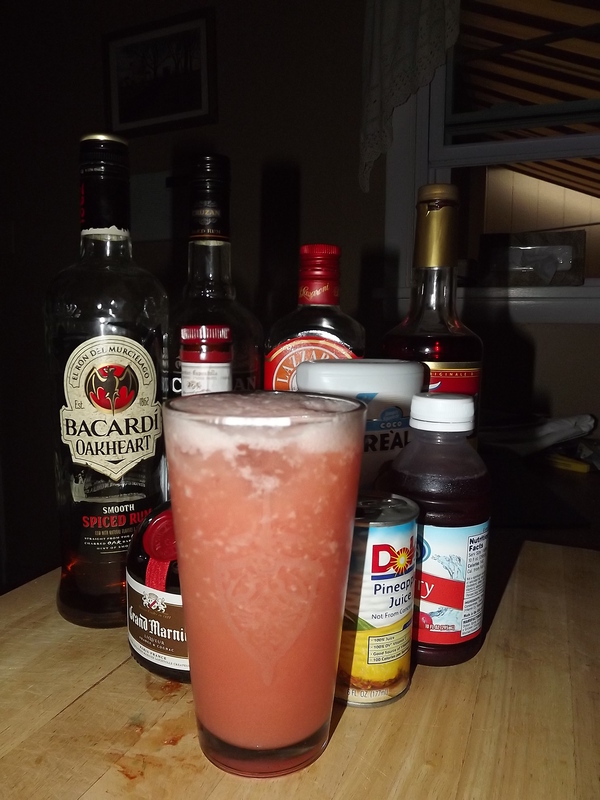 A wonderfully blended and sweet drink, this one comes very close to perfect. My recipe book calls for a whipped cream and banana garnish, but honestly I feel it kinda ruins it a little that way. For this cocktail you are greeted with a wonderful rum and banana aroma. First taste (it may be hard to pick it out) starts with citrus and sweet then moves to a creamy rum on your mid palette. After just a second or so you’re lead straight into a dominant banana flavor with subtle amaretto on the finish. 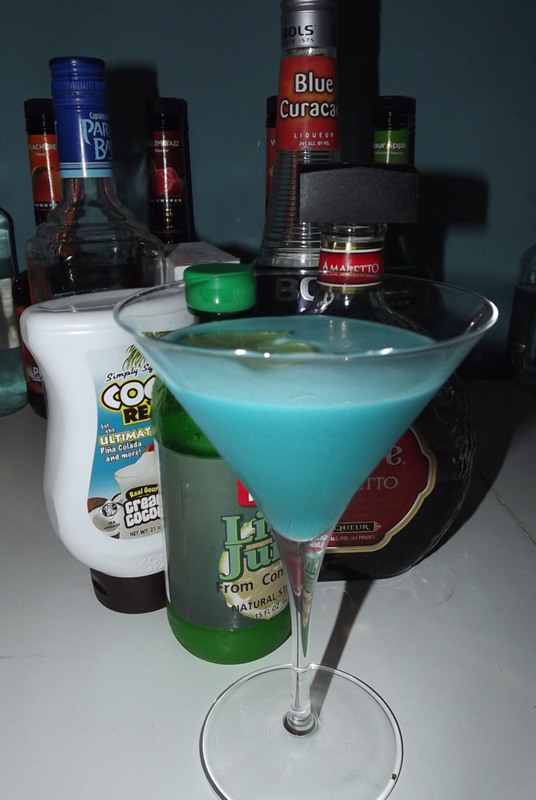 This drink is absolutely worth making! For yourself or a crowd I highly recommend checking this one out! Well this is one of those cocktails that can be described as “everything but the kitchen sink.” The drink actually doesn’t have much of an aroma which starts off very deceiving. The drink starts off like snow cone…sweet and icy, you’re then greeting by the wonderful mixing of rums, and you’re left with a complex mixing of juices, and liqueurs. The Grand Marnier and Amaretto are very subtle in this drink, but they are there. If you weren’t told about them you might just say “oh that tastes like spiced rum,” but when you recognize the flavors in the drinks aftertaste you’ll want to go back for more! Blend all ingredients with ice. Pour into a large pint, or 3-4 short glasses. 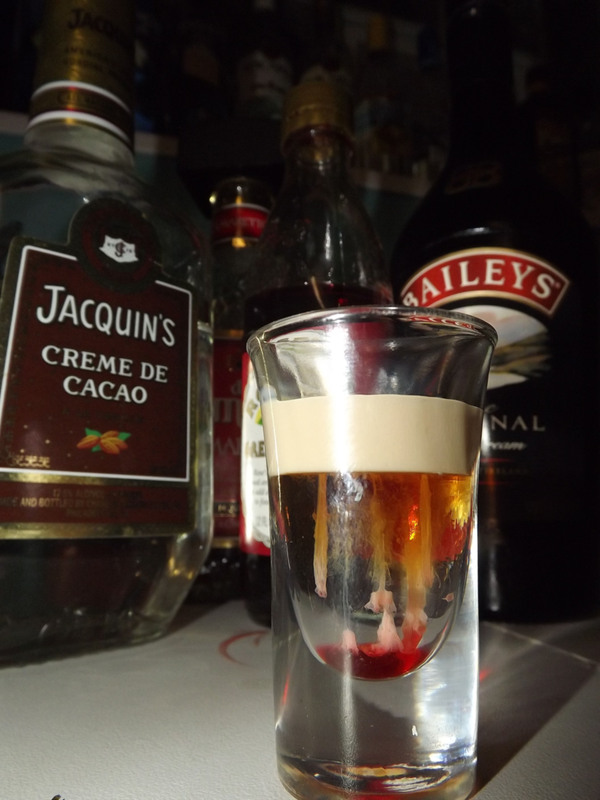 This week’s drink is one I’ve been dying to make for quite a while. The Razzmatazz cocktail get’s it’s name from the use of the Dekuyper raspberry liqueur of the same name. This simple after dinner sipping cordial style cocktail makes for a nice ending to any evening. The Drink has a great burgundy color and smells mostly of sweet raspberry. 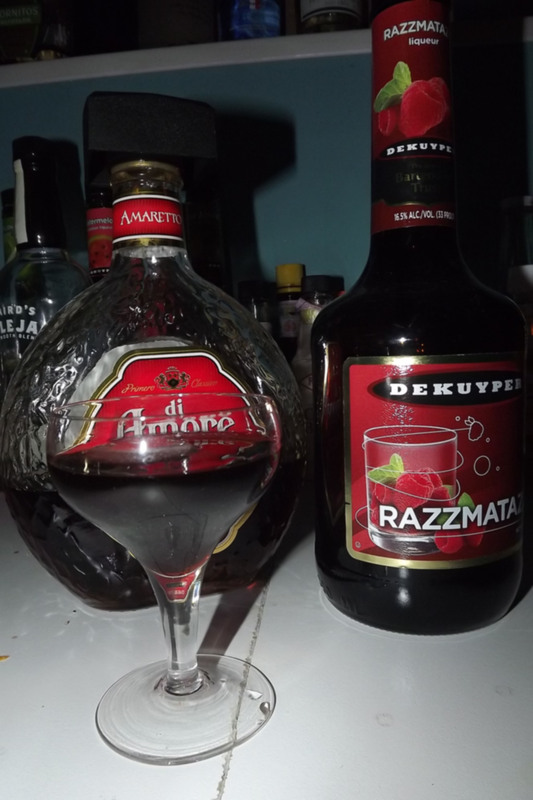 Mostly you get the strong syrupy taste of the Razzmatazz Liqueur but the underlying mix with the amaretto make it a great sipping drink. If you have the ingredients this could be worth trying for you. Straight in an iced tumbler or cordial glass. Today we’ve got one hell of a great blending cocktail! With a few minor substitutions to the “Bacardi Tropical Dream,” you’ll find this or a variation of your own to really impress your friends. 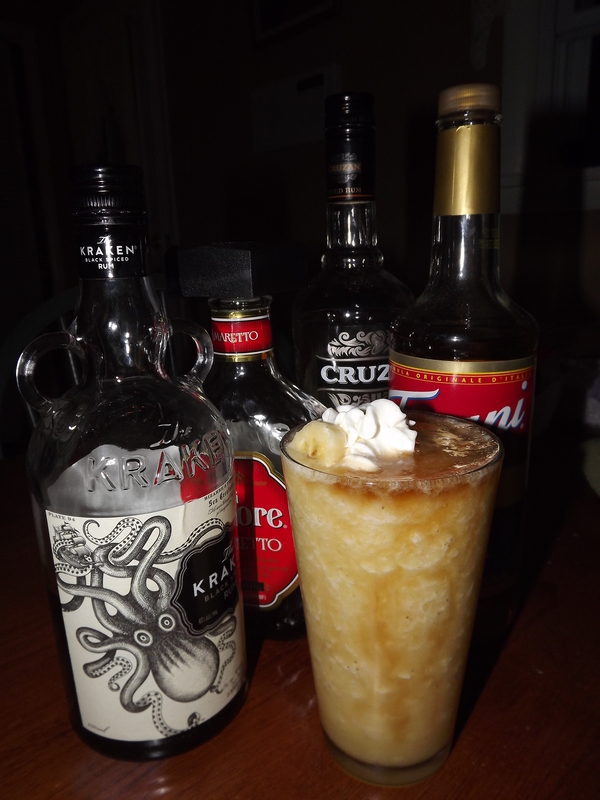 While the original recipe calls for Orange Rum and Bacardi Gold, I feel my replacement of Cruzan Aged and Parrot Bay Pineapple certainly didn’t hurt the outcome. In fact it may have made it better. 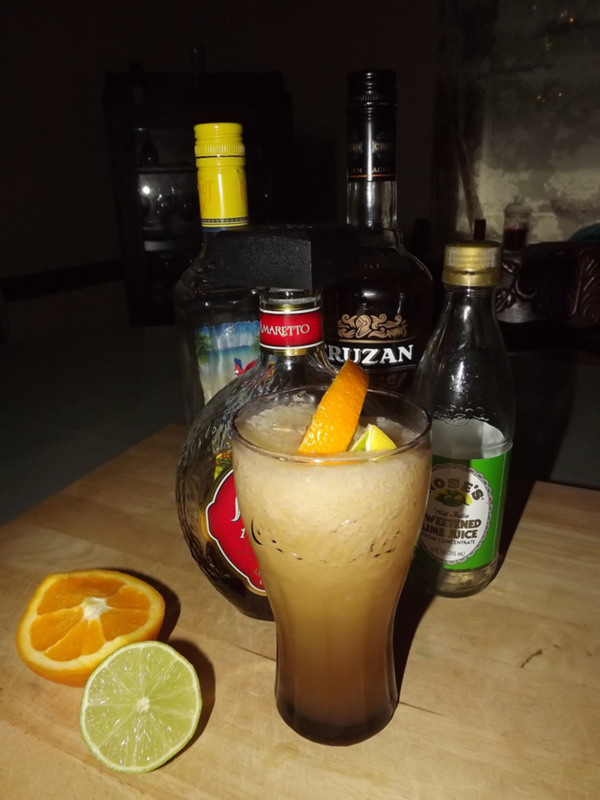 If blended well you’ll start with the icy sweet and tropical flavors of orange juice and your flavored rum. Then on your mid palette you get that flavored rum with the gold embodied in the bits of ice. Finally you get a mild sour from the underlying sweet/sour mix to really bring this drink home. 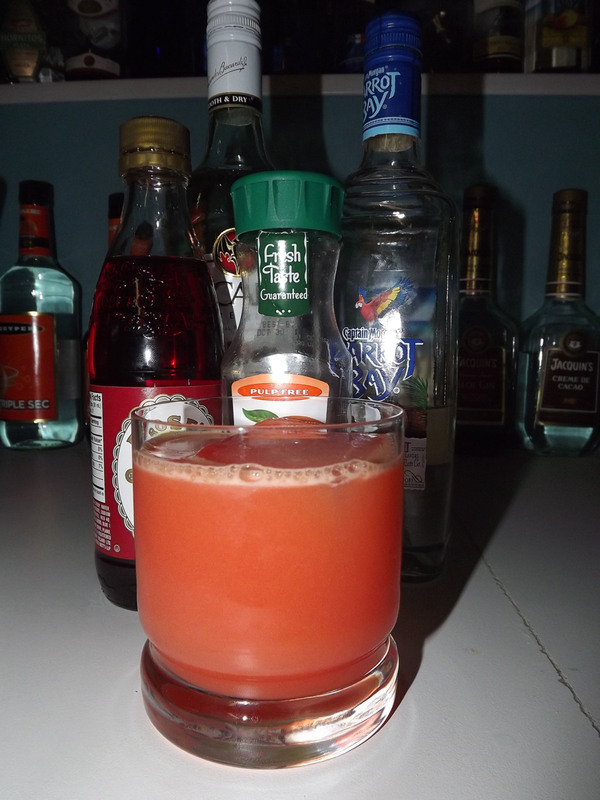 I do wish there was another juice component in the though as I found myself wanting a little more body in the drink. Although this could easily be solved with a little less ice. Bottom line, this is a great tropical drink for any occasion, and with a big enough blender it could be a great party highlighter. Well it’s after midnight, but I haven’t been to bed yet…so it still counts as Monday right? Ok then. Today’s drink is called “A Day at The Beach” and for good reason as it’s a very tropical themed cocktail. I didn’t have the necessary ingredients for the garnish, but the color still delivers here. A powerful red-orange makes for a brilliant presentation. Smelling of amaretto and OJ it’s a very inviting cocktail. The drink starts sweet with orange, moves quickly to a little almond/amaretto flavor and finishes on the great taste of coconut rum. It certainly reminds me of a relaxing day at the beach as there is hardly any bite at all. This is a perfect drink for those looking for a sweet summer cocktail. Make it again? Yes, actually a little too sweet for the menu, but a great one to suggest on a hot summer day. Shake and strain into an iced tumbler.